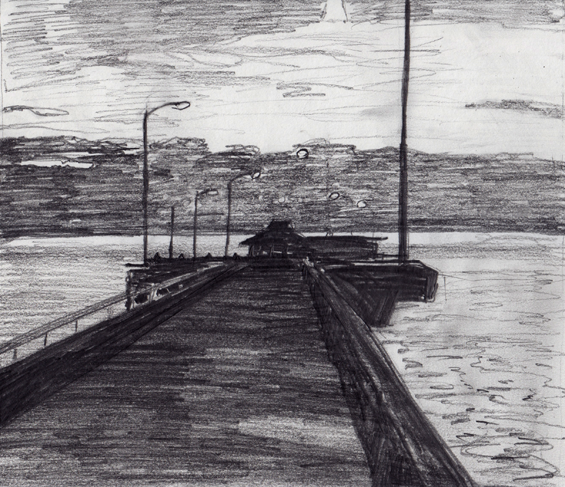 Drawing based on a shot from Venice Pier (Gary Beydler, 1976). Los Angeles is a universe of cities and roads and land. How does one get to (make) sense (of) it? Baudrillard felt that the best way is the plane, but aerial vision stops on the top of the things. Banham proposed to get in the car and hit what he called autopia. Soja, perhaps more courageously, explored real-and-imagined spaces of downtown L.A. on foot. And so on, and so on. But, one of the privileged paths to L.A. is still the very stuff of which it was and is being made – celluloid. As of late, I have been discussing cinematic incarnations of Los Angeles from the point of view of film noir. These visions are filtered through the perspectives of noir protagonists, necessarily fragmentary and patchy. This may as well be symptomatic of the entire experience of the city, and especially this city, almost a synonym for centrifugal sprawl. But, a carefully constructed collage of films may provide a good trajectory. Especially if these are, by their nature, non-fiction, and produced by a bunch of watchful experimental filmmakers. The other day I was lucky enough to attend to the screening entitled Urban Observations – LosAngeles, organised by Sheffield Fringe. Six films were selected by Adam Hyman, 'documentary filmmaker and executive Director of Los Angeles Filmforum, the longest-running showcase for independent, experimental and progressive moving-image art in Southern California'. Films have been shot over the span of half a century, and they cover are much more than just 'urban observations'.